PRODUCT: 30" x 1/4" SERRATED SQUEEGEE REFILLS, BLACK NEOPRENE. 6/BOX. PRICE/BOX. APPLICATIONS: Refill fits most squeegee frames. 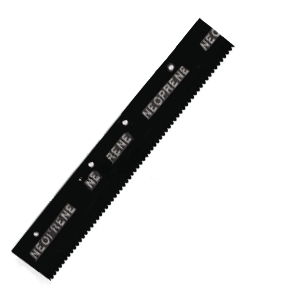 Petroleum resistant neoprene blade serrated edge for control of material deposit. Neoprene rubber blade allows flexibility of material thickness through pressure and angle applied.